Artist unknown, Sailor’s Quilt, late nineteenth century, wool felt, embroidery thread, 90 x 70". Hands with rifles in them seem like better playthings for the devil than just idle ones, but most of the devastatingly beautiful nineteenth-century quilts on view here are the products of assiduous busywork that likely kept the British Empire’s working-class soldiers and sailors out of trouble in their leisure time. Blood-red, blue, gold, and cream hues dominate the rich, matte mosaics, which are sewn from thousands of tiny hexagons, diamonds, triangles, and squares, excised primarily from the heavy wool of military uniforms. While some of these quilts are embroidered with heraldic or narrative elements—crowns, cannons, ships, or flags—such embellishments are afterthoughts to their exquisite geometric patterning. With their suede-like texture, meticulous construction, and palpable heft, they are seductive objects regardless of their backstories. But the eerie gravitas that distinguishes them derives from imagining the men sewing in their quiet hours, delicately handling fabrics that may have seen the chaos and horror of the Crimean War, Britain’s ruthless imperial expansion in Africa, or the brutal enforcement of colonial rule in India. The wall text tiptoes around the global role of its (mostly anonymous) male quilters, referencing their hardships in some detail while largely avoiding acknowledgment of the murderous rapacity of the British and the atrocities committed—perhaps by some of these crafters personally—in the very euphemistically termed “volatile landscapes” where they were stationed. And while I wanted more discussion of how the formal characteristics of these textiles might be influenced by local traditions, especially given the prominence of exoticism in the decorative arts of the Victorian era, credit is given where due to the extent it’s possible. 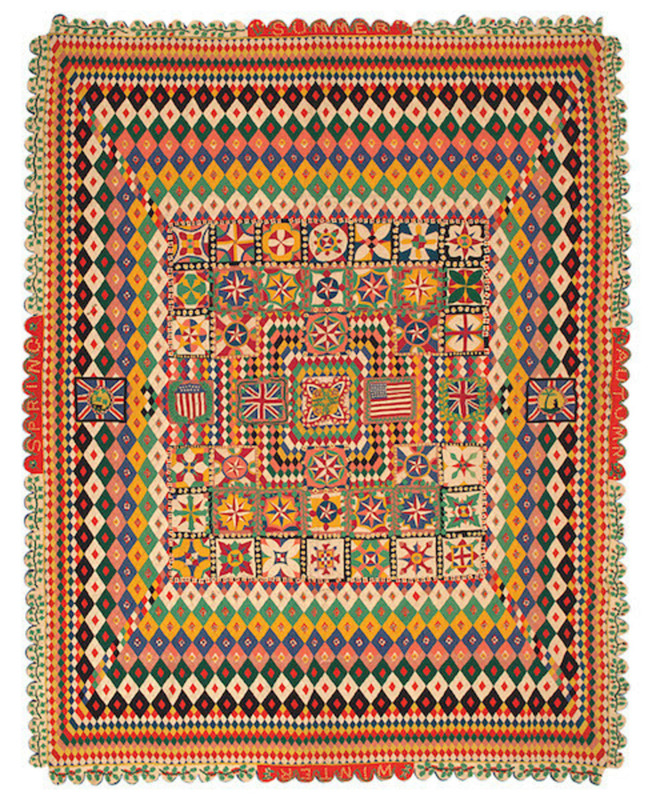 The most gorgeous quilts, featuring brighter colors, intricate appliqué work, and beading, are those from mid-to-late-nineteenth-century India. So virtuosic are their design and construction, the accompanying description notes that they are not always the work of untrained infantry but sometimes of regimental or—surprise, surprise—Indian tailors.